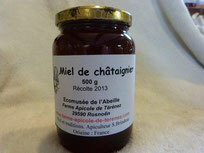 We dispatched our hives at the tip of Brittany and in the Perigord Pourpre. These wild areas are conducive to the production of honey and its diversity. Throughout the year, we take care of maintaining our livestock, so that, in summer, it is able to collect the precious nectar. All the production of our hives is brought to Térénez where we work. During extraction period, visitors can see the honey being taken out of the frames, filtered and put into jars. We invite you to contact us to know at what time we extract the honey. Next to the museum and workshop, a space is dedicated to the sale. One can taste the honey available, discover our gingerbread and enjoy our mead.